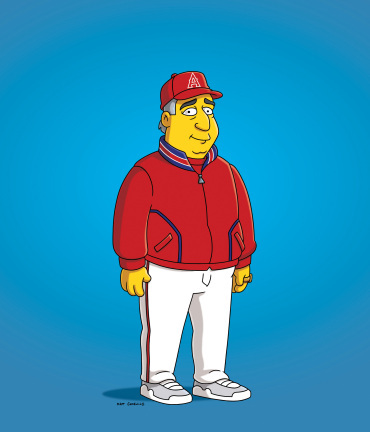 Major League Baseball Players & The Simpsons. | ninety feet of perfection. 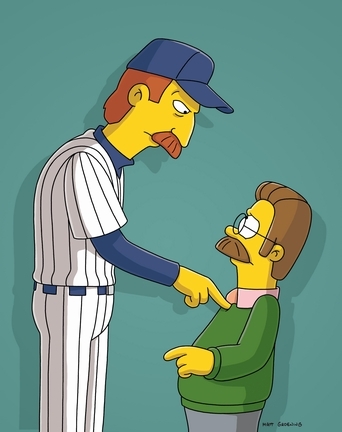 2 of my favorite things in life are Baseball and cartoons, specifically The Simpsons. In the last 20 some-odd years, there have been some very memorable episodes with Major League Players featured as characters. I just thought I would put together a little list of them and post on here in no particular order. I don’t list every appearance of every player to appear as there are a few little small things I left out (ie. Carl Yastrzemski’s rookie card that Milhouse almost buys, Ron Santo’s biography that Lisa finds at the library) but I think it covers the more memorable ones! Last Season (I cant find the episode info anywhere!?) there was a short snipit of Kirk Gibson of the Dodgers famous homerun off of Oakland Athletics Hall of Fame Closer Dennis Eckersley from the 1988 World Series. I was fortunate to come across an animated gif of the scene online a few days after it aired. “Brother’s Little Helper” aired October 3, 1999 (11th Season) and featured St. Louis Cardinals slugger Mark McGwire. To this day I still quote McGwire’s line “Do you want to know the terrifying truth, or do you want to see me hit some dingers? “Bart Has Two Mommies” aired March 19, 2006 (17th season) and featured left handed pitching legend Randy Johnson, then of the New York Yankees. In the episode he intimidates Ned Flanders into buying left-handed items to sell in The Leftorium. “The Twisted World of Marge Simpson” aired January 19, 1997 (8th Season) and features a scene where New York Yankee legend Whitey Ford is pelted by angry fans with pretzels until he is unconscious. For some reason I find this scene hilarious, check it out HERE. Too bad the clip leaves out the “This is uh….This is a black day for baseball” line from the Announcer which is the icing on the cake for this ridiculous scene. ~ by duaneharris19 on October 27, 2010. 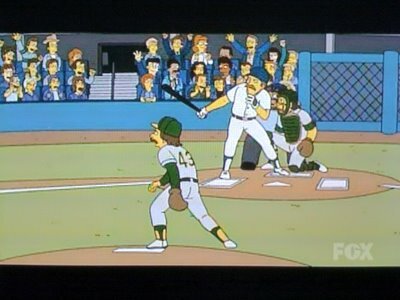 Homer At Bat – Best. Episode. Ever. 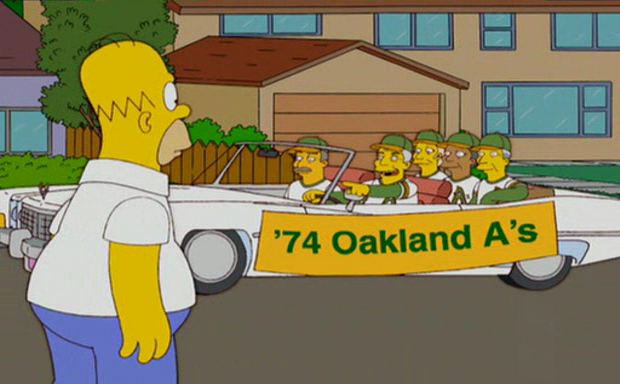 and as for the ’74 A’s… well, gonna go to the 40th Anniversary Reunion game this year! woot!